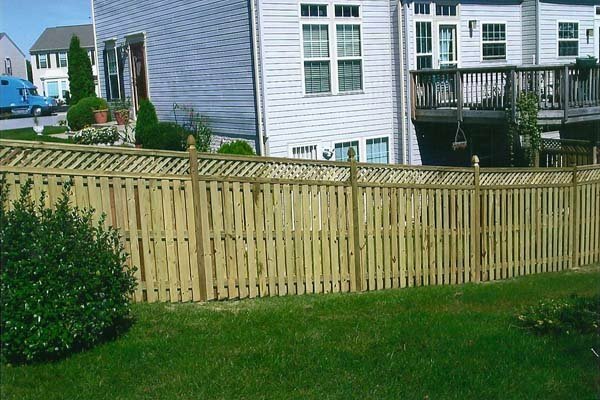 Adding a wood fence to your Harford County home can provide many benefits, both aesthetic and tangible. Luckily, you have A LOT of options, from vinyl to aluminum to steel and, of course, wood. What makes the most sense for your Harford County home? Well, it all depends on you, your circumstances and your budget. Over the next several weeks, we will explore the benefits of each fencing materials, starting with wood. The right fence makes a strong aesthetic statement, improving a home’s curb appeal. And perhaps no fencing material makes a bigger statement than wood, America’s top choice for residential fencing. In 2007 alone, Americans put up some 59,000 miles of wood fence. That is enough to circle the globe twice and then some. Yikes! But why? What makes wood such a desirable fencing material? For starters, wood is still one of the most affordable fencing materials on the market. Wood is also easily customizable. If you get tired of the color of your fence, change it with a new coat of paint or stain. The same is not true for other materials, such as vinyl. Best of all, there are many different styles of wood fence to choose from, including everyone’s favorites: picket and privacy. With so many options, no wonder wood remains America’s No. 1 residential fence. These fences can easily give a property character and individuality. There are plenty of uses for a fence: privacy, curb appeal, safety, block wind and noise, protect your swimming pool, etc. This entry was posted on Thursday, April 14th, 2016	at 11:55 am	. Both comments and pings are currently closed.